How does your email signature look? Wanting to give it a little sprucing up as well as make it consistent with what others are using at Hope? We’ve built a super slick HTML email signature generator (choose “Request”) which will provide you will a properly formatted and branded contact block to insert as your signature. Check it out and let us know how you like it! Thanks for attending Meet the Personas Open House! Thanks to those of you who attended our Meet the Personas Open House this week! It was great getting a chance to share these with our broader campus community. What are our User Personas? Fifteen (15) fictional characters that have been created to help us better understand the experience of Hope College’s various audiences. Posted on January 30, 2014 Author Jason CashCategories Brand, Website redesignLeave a comment on Thanks for attending Meet the Personas Open House! Please join us for our upcoming “Meet the User Personas Open House”. Fifteen (15) fictional characters have been created to help us better understand the experience of Hope College’s various audiences. We would like to introduce these personas to you and hear your feedback! Please come and go as your schedule permits. More information about User Personas & Scenarios. order form for business cards, letterhead, envelopes, etc. samples of each item and more! We hope that you will find this new page helpful as you continue to implement the brand and develop your messaging. Please let us know your thoughts! In the past few weeks we (along with Mighty, our website design partner) have been learning more about our identified website audiences so we can better communicate with them. Previewing exciting new changes to how we will be providing brand assets to campus (logos, letterhead, business cards, nametags, templates, etc). Sharing an overview of our user personas and scenarios, and introducing a few of them in depth. Walking through several exercises to begin learning how to utilize the personas, and using brand attributes to craft messages. You can sign up on our online form to attend one of these sessions. We’re excited to share that our friends at The Hope-Geneva Bookstore now have generic Hope College letterhead and matching #10 business envelopes featuring the new Hope logo in stock! For a limited time, the old Hope College #10 envelopes will still be available. Departments are encouraged to use these for any mailings generated on remaining stock of the old letterhead. 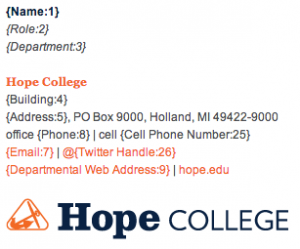 Generic Hope College letterhead can be a great and cost effective way to do mailings for campus departments.